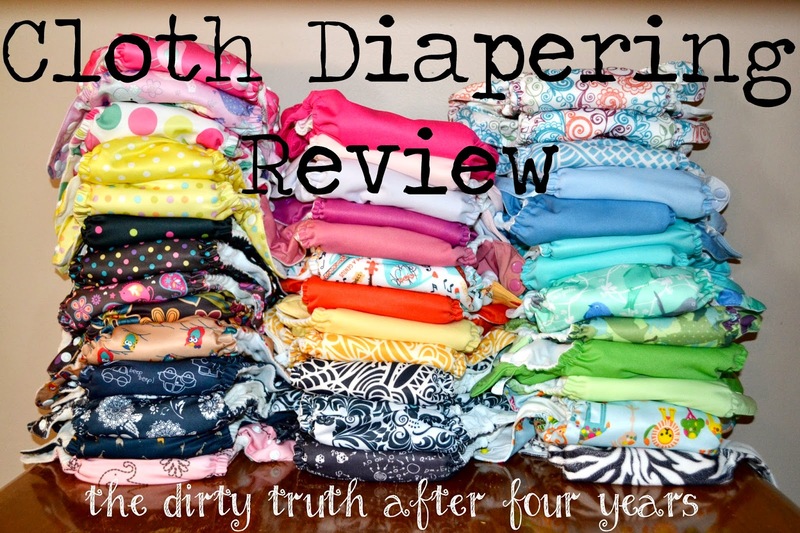 I can't even believe that I have been cloth diapering for over four years now! It feels like I was just beginning my cloth diapering journey, pouring over blogs and forums to learn everything I could. And now, here I am... four years and three babies later, and I'm still doing it. I'm still cloth diapering, and I still love it most days! So, first, let's share a picture of each of my little babes in their cloth diapers. Yes, I used to color coordinate diapers with headbands and dresses with the first two babies... especially the first. Happens much less with baby #3. She's just lucky if she gets dressed. Also, *wahh! * they grow so fast! It all began with this baby who is now four. She was my cloth diapering guinea pig. I also had a terrible camera back then and am so glad I have a nice Canon to document my babies now! So let's talk about what my STASH is made of. All of those diapers pictured above with my oldest, Sophie, are Sunbaby diapers. My cloth diaper stash began with Fuzzibunz and Sunbabies. The Fuzzibunz didn't end up being my cup of tea, so I sold those pretty quickly and then had all Sunbabies. Then I started buying Bum Genius and fell in love with them and still love BG dipes best. I kept some of my Sunbabies, so my stash is now made up of BG and Sunbaby, and I have been content with my stash and kept it mostly the same for the past two years/two babies (other than when crazy-diaper-addicted-lady-inside-me takes over and HAS to buy the adorable new release). All of the diapers I have mentioned are called POCKET DIAPERS. Pocket diapers are my favorite. Basically, you have an outer part of the diaper called a "shell" and then you stuff the diaper with an insert that collects all of the moisture. There are many, many more types of cloth diapers, and I haven't used or tried most of them. Some others cost more, some less. Some others are less work, most are more work. Some others probably work better, some worse. Really, you just have to research and find what you think you would like and go with it. You can always switch it up later if you need or want to. I chose pocket diapers because they're one of the easiest, within my budget, cute (yes, I admitted it), and popular so easy to find and obtain. Okay, before we hit it hard on the dirty truth of cloth diapering, let's ooh and ahh over my youngest baby, Lyla, and her stash. Poor middle child never got a picture with her stash. It's just like parenting. You think you have it all figured out, and then the baby changes her schedule or her temperament and you're back to being a new parent again. Or you have another baby who is nothing like your first baby. Cloth diapering is the same. You think you have it figured out, you're on a good routine, you love your cloth diapers, you're not having any leaks, and then BAM... leaks and rashes and you're frantically trying to figure out the problem and continue on. This is part of cloth diapering! It will take a little extra work, you will have leak problems that you have to solve, you will have rashes that may or may not be a result of using the diapers that you will have to troubleshoot. I would say the biggest changes happen when you change foods. When they go from breastmilk/formula to trying foods and then again when they are toddlers and start eating mostly food and less milk. The truth is, you will have points where you are frustrated and want to either give up or take a serious break or sell your whole stash and just start over. Cloth diapering truly is a learning curve. It takes time and patience to find out what works best for you and to fix problems when they arise. a. Diapers - The first thing you will have to decide is which diapers works best for you and your baby. For some Mamas, this is easy, and the first thing they try they love and it works great for their baby. Other Mamas spend a lot of time (and sometimes money too) to find a diaper that they are comfortable with or that works for baby. Some babies have sensitive skin or are extremely heavy wetters, and in these cases, Mamas spend more time finding what works. b. Inserts - If you are going with a diaper that requires an insert, you may have to test around with what works best in this area as well. There are quite a few choices! Microfiber is often the standard material of inserts that come with diapers, but these are not the most absorbent (and this kind can never go against a baby's skin!). There are also hemp inserts, charcoal inserts, bamboo inserts, minky inserts, and zorb inserts... and probably more that I'm not even aware of. Yes, there are a lot of choices! Don't be overwhelmed, though. Just try one and stick with it unless it doesn't work. I typically use the microfiber insert that comes with the diapers and then use a Bum Genius or hemp insert as a doubler. I always need a doubler, and sometimes two doublers, to prevent leaks. This was one thing that took me a while to learn. I thought I could be fine with one insert, but babies pee way too much for that! c. Laundry Detergent - And then there's what you wash your diapers in. There are certain detergents made for cloth diapers, but I don't think these are the only good ones, and honestly, many Mamas have found regular brands to work better. I personally use Tide free & gentle. I've tried several kinds, and this is what has worked best. You must make sure you have a detergent free of scents, and never use fabric softener. You not only have to find the brand that works but also the amount that works best with your washing machine. Too little, and they will be stinky and dirty after washing, but too much, and they will get build-up and leak. It's a learning curve, but stick with it. You will figure it out! I throw in a little bleach from time to time with my diapers, even though some people will say never to do this. You can also throw in tea tree oil with the diapers. I always dry the inserts, and I sometimes dry the shells and sometimes hang them to dry. I go in spurts with what I feel like doing. I have heard of diaper-crazy ladies who buy so many and really expensive brands that they don't save money in the end. But, for most of us, we will save money. If you want to ensure that you save money, here are some of my suggestions. a. Buy used/seconds: There are lots of ways to buy used diapers (forums, Facebook, craigslist), and I have done this. For some it might sound gross, but make sure to see pictures and get all the info you can before buying. I've had a lot of my diapers for three years, and they have no stains. Seconds are diapers that companies sell that have tiny flaws that make it so they have to lower the price, but they are completely great diapers. Many of my diapers are seconds, and there's only one that I actually know why it was a second (the print on the fabric didn't come out right, so completely a cosmetic issue!). c. Resell: Do you know what the coolest thing is about cloth diapers? They actually have pretty good resale value. Some even sell for more than what you bought them for, new or used. Isn't that crazy? People be crazy about some of the pretty, limited edition poop holders! I am always happy continuing with cloth diapering when I think about how I am saving money, and then occasionally I remember that I am going to sell them all when I'm done, and I get really excited that I will make money when I'm done diapering my kiddos. Can't do that with sposies! My Money Savings - I haven't kept exact records of what I've spent on diapers. I did for a while, and then I stopped. I would estimate that I've spent around $700 on diapers, inserts, and laundry detergent. (I have a newborn stash too, which I completely recommend if you're going to have more than one baby. Newborns are the easiest to cloth diaper!) Add in another $100 for all the washing and drying I've had to do. I doubt I've really spent that much on that part because I haven't had to pay those fees in a few of our apartments, but we're going to go with a high figure here and estimate $800 is what I've spent in four years of cloth diapering. There are a lot of numbers that people figure for the price of sposies. I'm going to choose a middle ground number and go with $800 a year. My kids have potty trained at two years, so that's $1600 for each kid until they potty train. $1600 x 3 kids = $4800. Which means I have roughly saved $4000 by cloth diapering!!! Cha-ching! Totally worth the frustrating moments. For me, what keeps me going (besides of the cuteness factor) is remembering reasons why I love it. b. Way better for the environment! d. No blow-outs. Seriously. We've had our share of pee leak issues, but I've never, ever had a blow-out in cloth diapers. I can't even count the number of disposable blow outs we've had, and I've barely even used them! The Bottom Line (see what I did there? ): Cloth Diapering is a love/hate relationship. For the most part, I love it. But there are times I hate it. But I either push through those times or take a short break, and then I'm always glad to be back at it again. Or I look at this picture and think of all the cuteness I've added to my life by having babies and cloth diapering these babies. Let's take one last picture to just stare at these pretty things. I mean, seriously... the prettiness totally gets me. If they were all white, I would be way less excited to change bottoms every day. For those curious, the stack on the left are Sunbaby diapers. The bottom two in the right pile are Kawaii diapers. The rest of the diapers are Bum Genius. This is my entire current stash minus two or three. I'm happy to answer any questions you might have. I don't have all of the answers, but four years has taught me a lot!